ISBN 0-9754183-0-0. Price: $29.95 USD, plus shipping. Many veteran modelers may have Mr. Auerbach’s old Arms and Armour Press “Tanks Illustrated” book entitled Last of the Panzers. 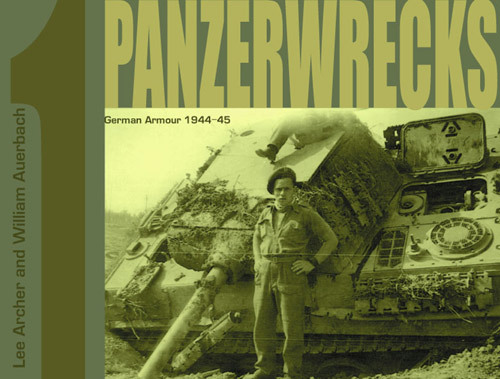 In that fine book, the author came up with a number of photos of late-war Panzers that were especially interesting due to their rarity or unusual features. The author combined these with well-researched captions, and created what amounted to a “cult classic” of a book. Here we are, some decades later and he is at it again, this time in collusion with Mr. Archer. Containing 124 B&W photos within a soft-cover landscape format book of 98 pages, this is the first book in what is planned as a multi-volume series. In fact, Volume 2 is already in preparation. And, in case you are wondering, the photos used here have very little to do with those seen in Last of the Panzers. So, this is no “re-hash”. There is an excellent variety of vehicles presented, and although the photos are dated as from the years 1944 and 1945, some earlier equipment, still in use at the time, is also included. Thus there are several interesting photos of various Pz.Kpw. II ammunition re-supply tanks. There are a few earlier models of StuG. III, Pz.Kpw. III and Pz.Kpw. IV, as well as “Alte” versions of the Sd.Kfz. 250. However, later vehicles are the primary focus of this book. These include: Panther Ausf. A, Ausf. G, Panther II, Jagdpanther and Bergepanther Ausf. G; Tiger I final version, Tiger II, Jagdtiger and Elefant; Pz.Kpw. IV Ausf. J, Sturmpanzer IV, Mobelwagen, Ostwind, Pz.Kpw. IV/70 (A) and (V), Nashorn and Hummel; Marder III and Flakpanzer 38. Various halftracks such as the Sd.Kfz. 7 (and its Italian cousin the Breda 61), Sd.Kfz. 8, Sd.Kfz. 250 Neu, Sd.Kfz 251 Ausf. D (in several versions); a couple of RSOs and various four- and eight-Rad armored cars are included. Finally, there are photos of a number of vehicles built on French chassis’, and an Italian Semovente, as well as a captured AFVs in the form of a Sherman Vc Firefly and an M8 armored car. In short, something for everyone! Some highlights include the Firefly with a KwK 40 muzzle brake on the 17-pdr. gun, the only known period photos of the 3.7cm Flakpanzer Ostwind and the Panther II chassis, and photos of various Panthers with odd field modifications. Another example of a “field mod” is an Sd,Kfz. 251 Ausf. D that has been converted into a stationary “Gypsy Caravan” by a group of Hungarian displaced persons, immediately after the war’s end. The photos come from a number of disparate sources and are therefore of uneven quality. This is counteracted by many of them being historically unique. In short, this means that the authors had to choose between using a less-than-optimum photograph or no photograph at all. As someone with an interest in all kinds of AFVs, I am glad to see the photos! While most photos were taken by average allied soldiers with relatively low-tech cameras (which produced images of a lesser quality), there are obviously several photos that were taken by trained individuals using larger format cameras. Since these are printed on an entire page, they are remarkably detailed. My two favorites include an incredible photo of an Sd.Kfz. 223 (fu) Ausf. B, of the 17. SS-Panzergrenadier Division, which contains an extremely fine level of detail, and a StuG. III Ausf. G of the same high quality. These are not by any means the only ones. There are a number of other photos that are of what I’d term “fair-to-good” quality as well. Bottom line: feast your eyes, you won’t be disappointed. There is a brief one-page introduction to this volume and the series in general, which sets the tone for what will follow. The captions are also well-written and contain as much known information as the authors could find. The authors state that they will resist the urge to speculate where information is not known, which is fine with this reviewer. There are a few very minor typographic errors (odd punctuations here and there), but no errors of fact were noted. At $29.95 USD, the price may seem a bit high, but the prospective purchaser must remember that this book is self-published in relatively limited quantities. It is therefore quite probable that this book will become sought-after the moment it goes out of print. In sum, modelers of late-war German AFVs will have a more than adequate source of inspiration. Students of rare and odd-ball German AFVs will likewise be pleased with what the authors have presented. This one’s a “keeper”. Available from the authors at: bill@panzerwrecks.com (For Asia and the Americas) and lee@panzerwrecks.com (For Europe). For image samples and further ordering information visit their web site at: www.panzerwrecks.com.